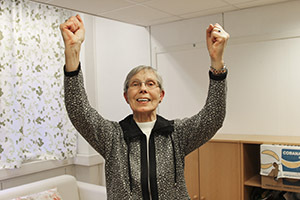 Sonja Berg Andersen (76) had 44 radiation treatments at the hospital, but the cancer cysts would not go away. Eventually she sought intercession with Svein-Magne Pedersen. When she returned to the hospital, all the cancer was gone. In the spring of 2001 Sonja Berg Andersen from Ulset near the city of Bergen started noticing that something was wrong with her body. She therefore sought her family doctor who took a number of tests. The doctor believed that there was nothing wrong, but Sonja was skeptical. She therefore requested a control by the gynecologist and the doctor thought it was a good idea. A few days later she received a notice of the new control. -When I came to the gynecologist, she quickly discovered that something was wrong. She did not want to say much, but when she sent a letter to the women's clinic in Bergen, I understood what it was about. Soon I received a new notice, and the doctors did new tests. There I was given the bleak message. -You have far progressed cervical cancer, the doctor said. -It is a sad message to receive. I had little experience with cancer, since I did not know anyone who had experienced getting it. I was therefore unsure of what awaited me. Sonja was quickly put on a series of radiation treatments. They were very extensive, and during the first few weeks she received 27 treatments. Every time they radiated several places, because there were many areas that were greatly infected by cancer. After a short break, she got 17 new treatments. In the course of nine weeks she had therefore undergone a total of 44 treatments. In addition she also got so-called hyperthermia treatment in which the body is warmed up to a certain temperature using microwaves. The aim is to enhance the effects of the radiation. -I had to lie in a warm room, and parts of my body were heated to over 40 degrees. Unfortunately I was rather ill from this treatment, but the radiation I endured okay. After some time, the doctor said that I had to quit having radiation therapy. The doctors put in great effort, but despite a number of radiations, the cancer was not gone. -It was sad that they were not able to get rid of the cancer. The doctor was also a little frustrated. He said I had to come back in three months for a new control and treatment. In the last few years Sonja has been a subscriber to the magazine «Healing». She therefore knew who Svein-Magne Pedersen was. A few weeks after the last treatment, she read an ad that Pedersen was going to have a meeting in Central Church in Bergen ( UMC ) (Methodist church). -I asked my husband if he could drive me there so I could receive prayer, and he did. There were a lot of people, and finally at eleven o'clock in the evening I received prayer. I did not notice anything in particular then and there, but I went home with anticipation. After a few weeks she got a new notice from the doctor. When the control was finished, she received an unexpected message. -We cannot find any find cancer, and everything is just fine, the doctor said, who seemed somewhat surprised. -I was so happy and relieved. The emotional situation caused me to completely forget to tell about the intercession. It would have been interesting to see his reaction. In the next three years Sonja was at a control every six months. Later she went every other year, and she has always been just as healthy. The last time the doctor said the chance of the cancer returning was minimal. -I know that it must be God who healed me. Cancerous tumors do not disappear on their own. I have always believed that it was Him who helped me. Thanks to Svein Magne who prayed for me! Sonja concludes happily.